Michael Hoey says this year's Northern Ireland Open at Galgorm Castle should attract an even stronger field after the success of the inaugural event. The European Challenge Tour event will return to the Ballymena venue from 28-31 August and the tournament ambassador expects more Ryder Cup players to play. Hoey was the big name at last year's tournament which was won by Dutchman Daan Huizing after a play-off. European Tour winners Nick Dougherty and Oliver Wilson also competed. Wilson, a member of the 2008 European Ryder Cup team, lost to Huizing at the first extra hole in the play-off. "2002 Ryder Cup player Philip Price is playing mainly on the Challenge Tour this season after losing his main tour card last year and he has already told me that he wants to play at Galgorm," said Hoey. "And I think a number of the Irish guys on the main tour could even end up playing here next August. "Darren Clarke spoke to me the week after last year's tournament and told me that he had heard that it had been a great tournament. "He even said to me: 'Can I play in that one next year? ', so I think he could be interested. "The likes of Peter Lawrie, Shane Lowry and Damien McGrane also had heard about the success of the event and they were asking me about it." After missing the cut last year in his opening stint as event ambassador, Hoey, who was recently unveiled at Galgorm Castle's touring professional, is determined to produce a better showing for his local fans in 2014. "It just didn't happen for me last year but my form so far this season has been pretty consistent and I will be hoping to keep that going right up to the Northern Ireland Open and during the event." Last year's inaugural event attracted Challenge Tour record crowds of over 22,000 for the four days and organisers are targeting an attendance of 30,000 for the 2014 tournament. 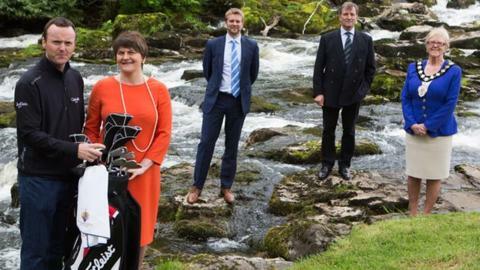 Tourism Minister Arlene Foster attended Thursday's launch at the nearby Galgorm Resort & Spa and said the staging of the tournament again this year would help "Northern Ireland's position as a 'must-play' destination for golfers". "The visitors that will pack the Galgorm fairways in August will see golfing stars of the future and will enjoy a superbly well-run tournament in beautiful surroundings," added the Minister. "Golf tourism currently generates £14m each year for the local economy and its further development will be an important drive to meet ambitious targets which aim to grow tourism to a £1 billion industry by 2020." Wilson described last year's event as the "best Challenge Tour event I have ever played" while Dougherty said that "the whole set-up and conditioning of the course was worthy of the European Tour". This year's players will be battling for a £140,000 prize fund with £22,400 going to the winner. This year's tournament will also include a food festival which will aim to showcase the best of local produce while, once again, PGA tour professionals will be on site giving free golf lessons to children attending the event. Local elite amateurs can book their berth at the Northern Ireland Open by winning the North of Ireland Strokeplay title at Galgorm on 24 June. Ballymena man and Irish international Dermot McElroy did precisely that last year and went on to finish a superb tied ninth in the big event. "Both the North of Ireland Strokeplay and especially the Northern Ireland Open are crucial events for the development of our young players," added Galgorm Castle's managing director Gary Henry. "To stage a European Challenge Tour here in Northern Ireland is vitally important for our home players like former Walker Cup team-mates, Alan Dunbar and Paul Cutler. "This event opens up so many doors and invites across European and allows players to build a playing schedule for the season."